Microcephaly is a rare, neurological disorder in which the circumference of the head is smaller than the average for the age and gender of the infant. Microcephaly may be congenital or it may develop in the first few years of life. This disorder may be caused by a wide variety of conditions that effect the growth of brain. It is often associated with chromosomal abnormality. Infants with microcephaly may be born with a normal or reduced head size. The head fails to grow while the face continues to develop at a normal rate, producing a child with a small head, a large face, and a loose, often wrinkled scalp. As the child grows the smallness of the head becomes more obvious. Whole body is also underdeveloped. Motor functions and speech are delayed. Motor ability may vary, and it may be clumsy movements or even quadriplegia (paralysis of both upper and lower limbs).Hyperactivity and mental retardation are common. Convulsions may also occur. The is no specific treatment in such cases. Treatment is symptomatic and supportive. Life expectancy is low and the prognosis for normal brain function is poor. 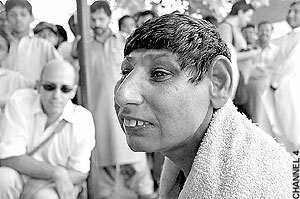 This entry was posted in Diseases & Conditions and tagged Microcephaly by Manbir & Gurpreet. Bookmark the permalink.